Creating ways for Selkirk College students to get the most out of their time spent in the classroom is enhanced by strong transfer agreements with other post-secondary institutions in British Columbia. Selkirk College Vice President of Education & Students Neil Coburn has been recognized for his work on helping build the impressive system across the province. Selkirk College Vice President of Education & Students Neil Coburn has been recognized for his commitment to strengthening transfer agreements and enabling student mobility in post-secondary institutions across the province. Coburn was presented the Leadership Award from the British Columbia Council on Admissions & Transfer (BCCAT) at the organization’s inaugural awards event late last year. Coburn was singled out for his work to further the goals of the BC Transfer System and promote the mobility of students across the province. 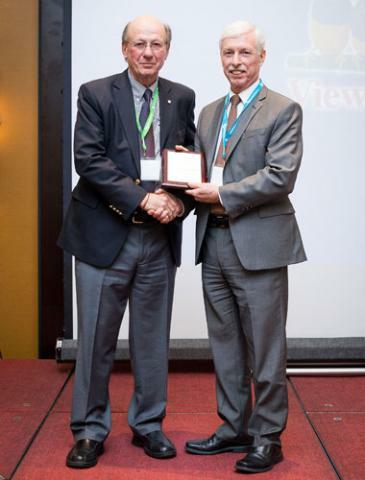 Selkirk College Vice President of Education & Students Neil Coburn (right) receives the 2014 BCCAT Leadership Award from BCCAT Council Co-Chair Dr. Roger Barnsley, Thompson Rivers University President Emeritus (left). Established in 1989, the BCCAT oversees the BC Transfer System, enabling important links between the BC post-secondary institutions. BCCAT facilitates admission, articulation and transfer agreements among BC post-secondary institutions for the benefit of students. Coburn started teaching at Selkirk College in 1997, first in computer science and then mathematics. He started working on transfer agreements as a member of the BCCAT math articulation committee, one of more than 60 committees in the province that work on creating transfer pathways for students. Every course in the School of University Arts & Sciences is articulated, enabling those who start at Selkirk College to seamlessly carry forward their educational goals at schools like the University of British Columbia, Simon Fraser University and the University of Victoria as well as many others. Over the last 15 years, block transfer agreements have also been a main focus of BCCAT and have been highly beneficial to Selkirk College students. Block transfers enable graduates of two-year Selkirk College diploma programs, like Resort & Hotel Management, to move into the third year of study in degree programs at other institutions. Coburn was appointed by the Minister of Advanced Education to the BCAAT Council in 2008 where he has helped guide the work of the organization. Last year Coburn completed his second term, the maximum allowed. While working with the Council on continually enhancing the system for all of British Columbia over the last six years, Coburn has in turn helped students in the region bolster their educational opportunities. In total there are more than 80,000 course transfers in British Columbia and all can be found on the BCCAT website (bccat.ca). Mapping out pathways for students can be done with the assistance of Selkirk College counsellors who can help connect the dots. Find out more about Selkirk College course transferability and join us on Facebook.